As instructors, we sometimes look for ways to create big changes in our courses, departments, and degree programs. Searching for complete overhauls to our teaching practices, we risk losing sight of the small changes we can make in our next class meeting. James M. Lang, author of Small Teaching: Everyday Lessons from the Science of Learning, believes that fundamental pedagogical improvement is possible through incremental change (4). For example, he explains how asking students to make predictions increases their ability to understand course material and retrieve prior knowledge. He offers various strategies for incorporating prediction exercises into the classroom, such as utilizing a brief pretest on new material at the beginning of class, asking students to predict the outcome of a problem, or closing class by asking students to make predictions about material that will be covered in the next class (60). As Lang says, “predictions make us curious,” and as instructors we can encourage student curiosity if we allow them to make predictions about the course material. 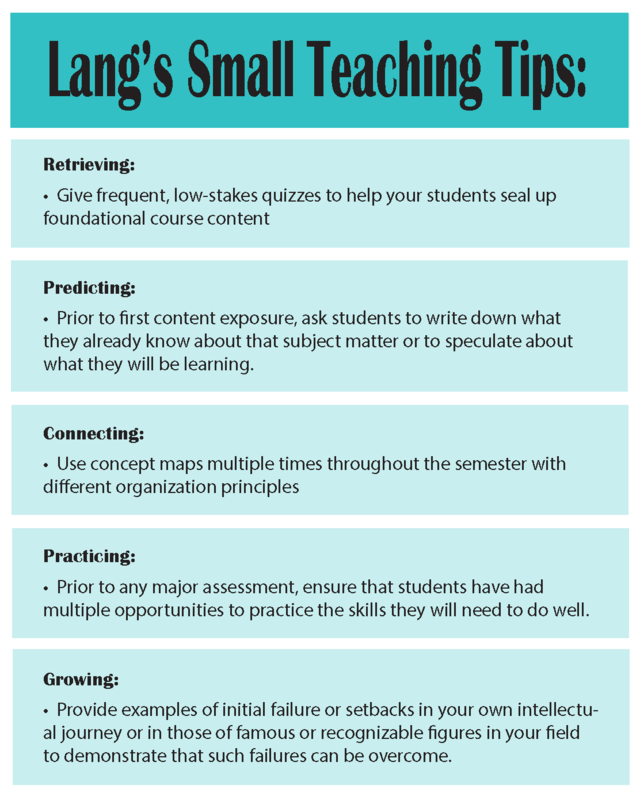 In Small Teaching, Lang shows how instructors can capitalize on minor shifts to a lesson plan to motivate students, help them connect with new content, and give them time to practice the skills required on formal essays and exams. As Lang explains in the introduction, small teaching defines a pedagogical approach “that seeks to spark positive change in higher education through small but powerful modifications to our course design and teaching practices” (5). Lang argues that big changes begin with each new class, and he provides numerous strategies for enacting those changes. An English professor and director of the Center for Teaching Excellence at Assumption College in Worcester, Mass., Lang says that small teaching practices can be utilized by teachers from any discipline, in any course, at any point in the semester. Lang understands that many instructors, such as adjuncts and GTAs, lack the time and the resources necessary to make major curriculum shifts in their departments. Small teaching allows instructors of all levels to innovate their teaching and generate enthusiasm in the classroom in ways that are incremental, deliberate, and, most importantly of all, accessible. Brief (5-10 minute) classroom or online learning activities. One-time interventions in a course. Small modifications in course design or communication with your students. Over three sections, organized under the broad categories of “Knowledge,” “Understanding,” and “Inspiration,” Lang provides numerous ways to implement small teaching, even during the opening minutes of tomorrow’s class. For example, Lang shows how we can motivate students to develop an emotional response to the course material by telling great stories: “Once class has started, the simplest way to tap the emotions of your students is to use the method that every great orator, comedian, emcee, and preacher knows: begin with a story” (182). Drawing from the research of experimental psychologist Sarah Cavanagh, Lang explains how “when emotions are present, our cognitive capacities can heighten; so if we open class by capturing the attention of our students and activating their emotions with a story, we are priming them to learn whatever comes next” (182). While great stories don’t necessarily lead to great class sessions, they do allow for students to create an emotional bond with the course material. The above example proved to be my favorite of the activities outlined in Small Teaching. As an instructor of freshman composition, I often feel as though my students enter college lacking a positive emotional relationship to writing. They associate writing with an instructor’s judgment on their intellectual capabilities. Realizing this, I decided to open one of my classes with a personal story about a former instructor of mine who would humiliate students for their lack of quality prose. After sharing an anecdote in which I was the recipient of a particularly harsh and public critique, I admitted how his experience affected my confidence while also explaining that I did not let this moment define my identity as a writer or a student. I asked my students if they had any similar experiences with writing. Sure enough, several of them shared that their relationship with writing was dominated by the “red pen” approach of a past instructor, and some of them shared stories of procrastination gone wrong. This conversation allowed me to explain my approach to grading and assessing student writing, increase my transparency as an instructor, and also commiserate with students about the difficulties of writing for an academic audience. My decision to begin class with a personal story altered the emotional climate of the room, and my students’ engagement with the course material benefited from that shift. “Tell Great Stories” is just one of many activities Lang shares throughout Small Teaching. Balancing a personal tone with clear explanations of the psychological and cognitive research backing his argument, Lang ultimately collapses the binary between “small teaching” and “big changes.” Perhaps they are one and the same, each informing the other, and leading toward necessary shifts in higher education, one class at a time. Tagged evidence-based teaching, learner-centered teaching, teaching tips.